This content was split off of our power combining page. 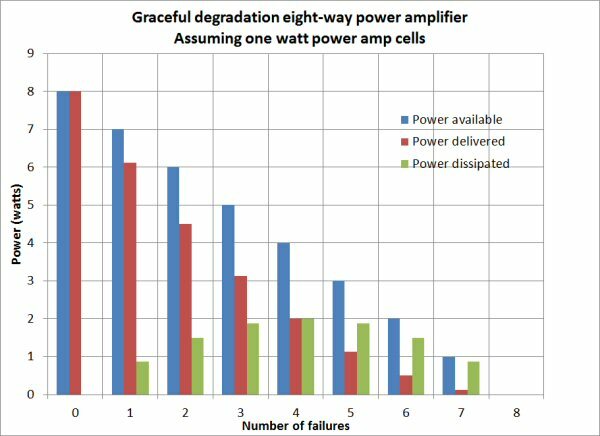 If you are to be involved in designing solid state power amps, it is important that you understand this entire section on graceful degradation, especially the part about failure isolation. Below is a simple Wilkinson power divider, with one leg terminated in a short circuit. We have added a transmission line that is controlled by a swept variable to move from 0 to 360 degrees in 45 degree steps. Click the images to zoom in. 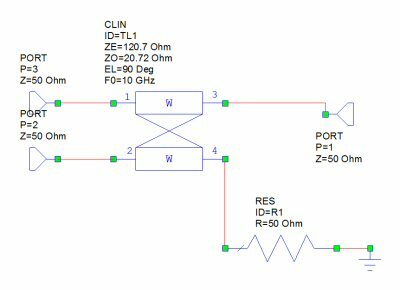 This is our way of simulating what the power splitter will do when an amplifier fails; the failure will likely be a short or an open, but you won't know the phase, so here we will examine the full range of phases possible, thanks to Microwave Office. The insertion loss (purple) is 3.01 dB at center frequency (left Y axis), just as it would be if that reactive termination was 50 ohms. When driven as a combiner, the loss of an ideal Wilkinson is zero dB, as two coherent signals add up. When there is only one signal, you get 3 dB loss in an isolated, 3 dB splitter. The match seen at port 1 (red, which will be at the output of a two-way power amp) is 6.02 dB at center frequency (a 3:1 mismatch, see right Y axis). Your transmitter system is not going to like this, possible failure is just one great reason to put an isolator on the output of an SSPA (the other great reason is to prevent load pull). Perhaps most importantly, the match seen at Port 2 (brown) is what the remaining power amp will see. 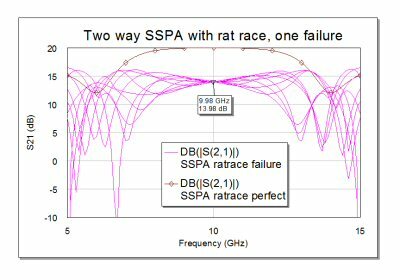 It is still perfect at the center frequency, or at least as perfect as what the SSPA will see in the system, because you put a circulator between the antenna and the SSPA. You are going to add a circulator (unless your spouse is correct and you never listen, and he/she is probably fooling around with the yoga instructor who is a great listener... sorry you had to hear about that here of all places.) This is failure isolation at its best, the blown amplifier has not compromised the remaining amplifier's impedance environment. What about the assumption that a failed amp presents an open or short circuit? When an amplifier is barbecued through mishandling, this is likely the case. But don't believe everything you read on a free site on the internet. An amplifier could fail if its input RF bond comes loose. In this case the input would be an open circuit, while the output might present a 3:1 mismatch to 50 ohms. Does this change the analysis? Think about that for homework and send us the answer and we'll post it. Where does the power go, when you lose that 3 dB? It depends on the direction you are passing energy. 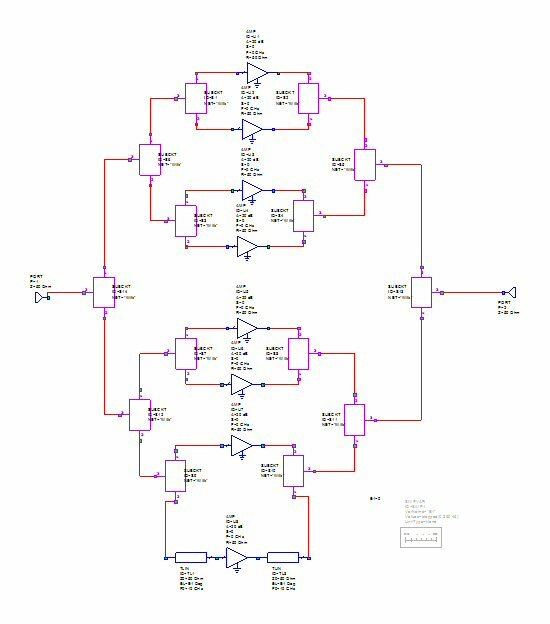 When you apply power to Port 1, 25% of the power of that power is reflected (3:1 mismatch) and 25% is dissipated in the isolation resistor. This is the case of the power divider on the input of a two-way SSPA. When you apply power to Port 2, half the power is dissipated in the isolation resistor, and none is reflected (at least under ideal conditions at center frequency). 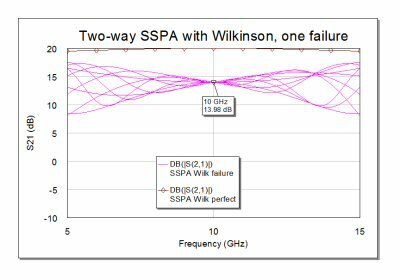 This is the case of the combiner on the output of a two-way SSPA. 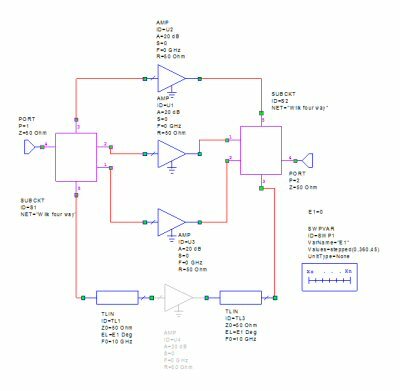 If you want to design for fault tolerance, that isolation resistor should be sized to handle half of the power of one of the amplifiers that drives past it. Two-watt power amps? The isolation load load should handle one watt. Unless you are using a Gysel combiner, which has two loads (in that case they each need to handle 1/2 watt). The return loss at Port 1 is worth thinking about. Why is it exactly a 3:1 mismatch? In the easiest case to analyze, TL1 is 0 degrees and the lower arm sees a short circuit. Looking back from Port 2, the 100 ohm resistor is in parallel with the system impedance (50 ohms) and so behaves as 33.33 ohms. The 70.7 ohm quarterwave TL2 makes that into 150 ohms (a 3:1 mismatch). The shorted stub TL3 has no effect as it is a quarterwave. As for analyzing other cases where TL1 is not a short circuit, what do you think this is, an IEEE article? 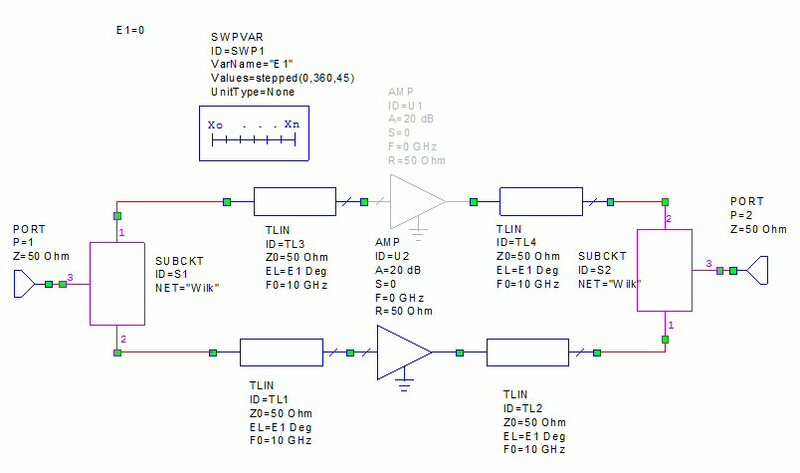 You can verify that the length of TL1 has no effect on the mismatch, using linear simulator like Microwave Office. Let's propose a theorem, and offer no analysis (yet) to back it up. For any two-way, ideal, resistor-isolated coupler, if you disconnect one of the arms (open or short), the common port will see a 3:1 mismatch. 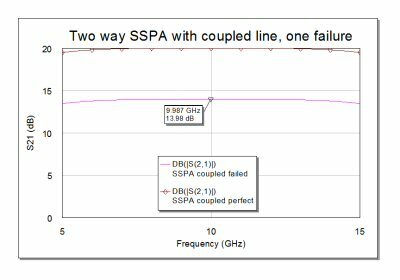 Thus a two-way SSPA is doomed to have just 6 dB return loss (or worse) at either port when one amplifier fails. Now let's look at a simple reactive splitter (a Wilkinson without the resistor). If one leg is connected to a short circuited transmission line, what happens? 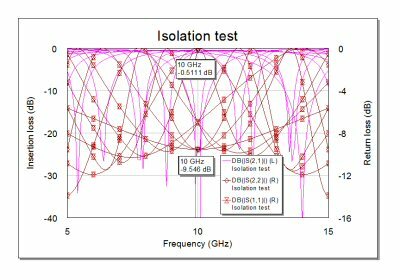 The insertion loss (purple, left Y axis, not the scale is -40 dB to 0 dB) can be anywhere between 0.511 dB and tens of dB (infinite in the ideal case). The 0.511 dB case results when the arm is shorted, such that if forms a quarter wave stub (open circuit), and the circuit looks like a 70.7 ohm transformer, so both S11 and S22 look like 100 ohms, or a 2:1 VSWR, or 9.546 dB (best-case) return loss. 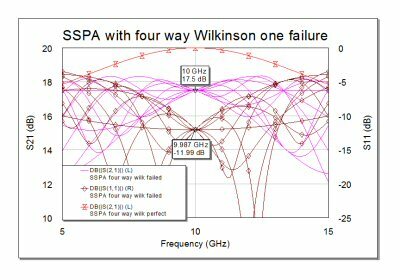 Although the "loss" is quite low in this one case compared to what happens in a Wilkinson, your power amplifier won't be happy, as you are load pulling it considerably. Note that because this is a passive reciprocal network, the magnitude of S11 is equal to the magnitude of S22 and the brown and red lines lie on top of each other. In the worst case, the return loss is zero. Why would anyone design an SSPA using a reactive splitter? Simple answer: they don't. 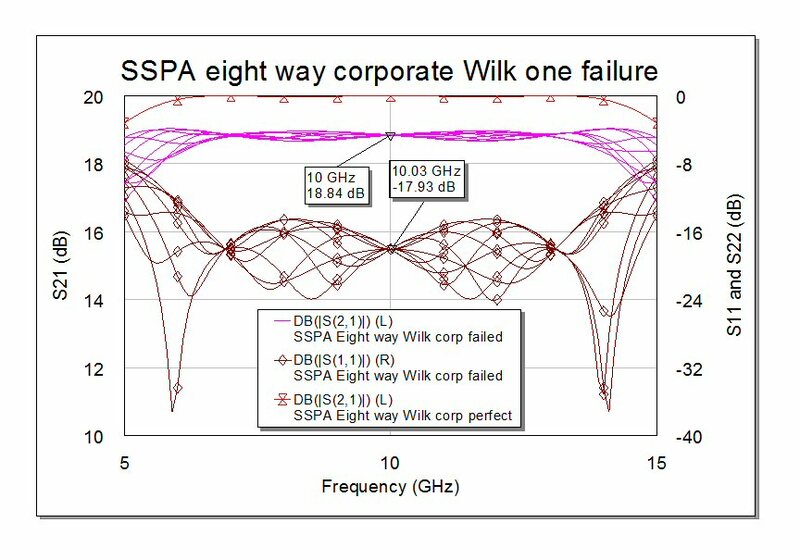 Now let's look at what happens in various two-way SSPAs when one amplifier fails. We chose 20 dB gain for our amplifier, and we put in sections of transmission lines to rotate the phase of the failed amp (U2, which is grey because it is discombobulated). Let's look at the loss of gain in four cases, using a Wilkinson, a branchline, a rat race, and a Gysel. The brown line represents the gain of the SSPA when both amplifiers are functioning. You will notice that the Wilkinson has the most tolerance to failure, in that its gain deteriorates less across the bandwidth. We didn't plot S11 and S22, and they are both -6.02 dB at center frequency for any phase in the failed amp. Note that at center frequency, the gain of 20 dB is reduced by -6.02 dB (75%) and you have to pass through two isolated splitters that are no longer combining the coherent amplifier outputs. Note that six dB of gain does NOT imply that you have lost 6 dB of available power. You lost three dB on the input side, so if you can drive the SSPA sufficiently, you have only lost 3 dB of available power. Note that the available power was decreased by 3 dB, as you lost one of the two amplifiers, so compared to the output power of two amplifiers, you are down 6 dB. Thanks to Austin for asking us to clarify that! What happens in the case of a coupled-line coupler used in an SSPA (such as a Lange)? 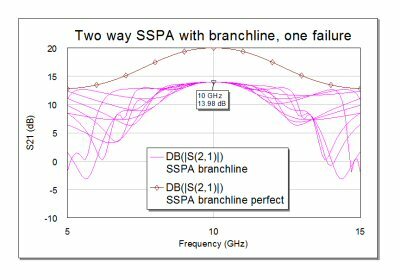 In this example we used an ideal coupled transmission line which has 3 dB split at center frequency. It is not intuitive, but coupled-line couplers used in power combining are immune to the effects of the phase angle of the reflection coefficient of the failed amp. What does this say about our forefathers at companies such as Avantek using thousands of Lange couplers to build power amplifiers back in the day? They were pretty smart! Now let's look at a four-way amplifier. In the case below, we have a four-way Wilkinson combiner which was used to create an SSPA. Gain drops by 2.5 dB when one amp fails, which is -20xlog(3/4). We also plotted the reflection coefficient, it is now 12 dB instead of -6 dB when we had a two-way amp with one failure. The result is that the gain drops by just 1.16 dB (now 18.84 instead of 20 dB), which is -20xlog(7/8). The reflection coefficient is now almost -18 dB. Do you sense a pattern (or two) going on here? When you combine power sources (power amplifiers driven at the same phase angle), if you have good isolation, an amplifier can fail in the network and output power of the network will degrade "gracefully", as opposed to a single source that fails catastrophically. However, it isn't as simple as calculating the fraction of power amplifiers that are left operating (thanks to Shane for the correction). Some of the "leftover" power gets dissipated in the isolation resistor network. You have to consider the available power, which is degraded by some dissipation in the output network, which gives rise to a squared term. Time for a Microwaves101 rule of thumb! In an N-way combiner, if one or more amplifiers fail, the gain and delivered power will both (ideally) be reduced to the square of the fraction of working amplifiers provided that your system can enough drive power to keep the amplifiers saturated. For example, one failure out of eight results in 76.6% power [equal to (7/8)^2] or -1.16 dB reduction. One failure out of four results in 56.25% power (-2.5 dB). If one amp fails in a two-way combiner, you only have 25% of the original combined power (-6.02 dB). Yikes! The available power drops exactly as you think it would, as (N-X)/N where N is the number of amps and X is the number of failures, while the delivered power goes as the square of fraction of available power. Something to consider if you are designing for the possibility of failure. Below we have plotted available power, delivered power and dissipated power as amplifiers are lost in an eight way power amp with one watt cells. When one amp is lost, the available power is 7 watts, but only 6.25 watts is delivered as 0.875 watts is dissipated in the isolation network. Note that the isolation network dissipation is highest when half the amplifiers are off, as two watts are delivered from four watts available. By the time you get to just one amplifier on, only 1/8 watt is delivered from 1 watt available (7/8 watt dissipated). 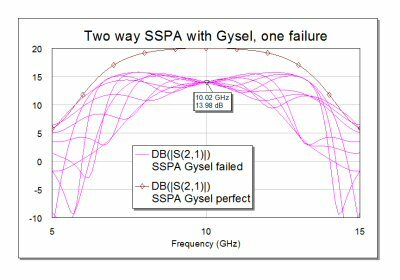 There is a special case where you might want to operate just one amplifier in an N-way combiner: you might want to check the phase errors between the amplifiers by measuring S21 angle of each individually (see below). If you want to drive them to saturation, you need to increase the drive power significantly. In the case of one amp in an eight way, the drive must be increased 9 dB. Note that you should consider the ability of your isolation network to dissipate 7/8 of the power of one of the cells in this case. Exactly which resistors get pounded in an eight-way isolation network? We'll save that analysis for another day, but you should start thinking about it if you were to try this type of test. One more thing: the impedance match of an amplifier that is turned off (instead of failed) will likely have a real component, our analysis above assumed that the amp failed to an open or short circuit. If you are in the SSPA game, you should get S-parameters of your amplifiers in the off state so you can model this event properly. These are often called "cold S-parameters". If you plan to operate the amplifiers at a non-zero gate bias when they are inactive, you should take S-parameters of them under this condition.